Ron was elected by the TCU/IAM Executive Council to National Vice President effective January 1, 2010, he was re-elected to that position at the 2014 TCU/IAM Convention. Brother Kloos also assumed the duties of TCU/IAM National Legislative Director. Ron began his railroad career with Amtrak in 1984, joining District 2500 in Chicago. After being elected District Chairman in 1991 he went on to become Vice General Chairman of System Division 250 overseeing the Midwest region. 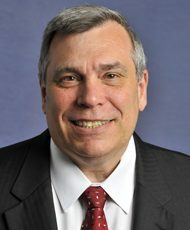 From 1998 to 2005 he was elected and served as General Secretary Treasurer of System Division 250 and was subsequently elected General Chairman, representing Amtrak clerical and on-board workers. During that time he served two terms as Chairman of the Amtrak Services Workers Council (ASWC). In 2009, Brother Kloos was assigned to TCU/IAM’s Legislative Department.